If you’re trying to make a decision about which knife block set to purchase, we can help make that decision easier with our best knife block set reviews for 2018. It can be really difficult to choose the right knife set and most people end up choosing based on price, rather than looking into the best features of each set, because of a lack of information that can be found online, but it doesn’t have to be that way. We’ve tried many different types of knives and we know which ones we would recommend, based on experience. We’ve held the knives in our hands, used them for chopping and dicing in our own kitchen, so you don’t have to spend any more time looking for the right knife set. Just keep reading. You’ve made a good decision to purchase a kitchen knife block, especially if you’re the type that just throws all your kitchen knives into one drawer. Not only is it dangerous to store your knives that way, it’s not a great way to care for them. They will need more frequent sharpening and maintenance from being in a drawer full of other utensils. A knife block will protect your knives, and keep them sharp. But the best thing about a knife block set is that all the knives you need are packaged together, so you don’t have to buy them one-by-one, nor do you have to look for the right knife block to hold them all. This will save you both time and money. → Don’t forget to purchase the right type of cutting board to keep your knives sharp! If you don’t have time to read all the reviews below, we’ve put together a quick-pick list for you, so you can make a fast decision based on our top recommendations. See below for full reviews. Since many purchase decisions are based on pricing, we’ve chosen a knife block set from a variety of price ranges, to fit everyone’s needs. The block sets listed here are all top quality, reliable knives. This is our favorite kitchen knife block set for many reason. Victorinox is often the first choice for professional chefs and they are often chosen by experts as some of the best knives on the market. The blades are made with high carbon stainless steel, so they are sturdy and sharp. They have excellent edge retention, so you don’t have to worry about them going dull quickly or needing to sharpen them frequently. I particularly like the handles of these knives because they are easy to grip and hold on to, thanks to their ergonomically designed shape and fibrox handle. They won’t slip out of your hand. These knives are also lightweight and well balanced to make cutting easier. In this 8-piece set, you’ll get a 4-inch paring, 6-inch boning, 8-inch chef’s, 8-inch bread, and 10-inch slicing, plus a sharpening steel, shears and the hardwood block. These are all the kitchen knives you really need to get the job done. This Calphalon Classic knife set is the first nice set of knives I ever purchased. I really like the weight of the knives and the sturdy feel they have in your hand. The handle on these knives has improved a lot over the years and now have a good contour, so they are now very easy to grip and hold. Plus, the knives are labeled at the end of each handle so you don’t have to hunt around for the right one. The blades are made with forged, high-carbon, stainless steel. One of the major benefits of this knife set is the build-in ceramic sharpeners, so every time you put the knife away, it’s being honed for you. This feature greatly cuts down on the time and energy you have to spend on maintaining your knives. 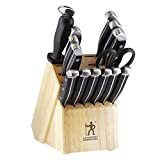 In this 15-piece set, you’ll get a 4-1/2-inch paring knife, 6-inch utility knife, 6-inch serrated utility knife, 7-inch Santoku, 8-inch, chef’s knife, kitchen shears, 8 steak knives, and the sharpening knife block. With so many useful knives in the set, it’s a really good value for the money. Do note that the set doesn’t include a bread knife. Made with high-quality stainless steel, the J.A. Henckels knives have been trusted by chefs and home cooks since 1895. They have very fine edged blades that are honed for long-lasting sharpness. They have a single-piece, stamped blade construction, so they are lighter than forged blades, and they have a full tang. The sleek-looking triple rivet handle is made to be easily gripped, so you don’t lose control of the knife while cutting. We really like this knife block set because of the value for the money it offers. The addition of the bread knife make it a complete set that you won’t have to add to. The quality of the blades will mean that you don’t have to sharpen them repeatedly. 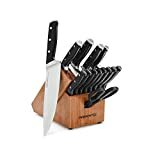 Set includes 3″ paring knife, 5″ serrated utility knife, 7″ Santoku knife, 8″ chef’s knife, 8″ bread knife, and six 4.5″ steak knives, plus a sharpening steel, kitchen shears, and a hardwood block. Read more about German knives and why they provide great value and reliability. If you don’t want to spend a lot of money on a knife set, you really need to be sure you’re still getting high-quality knives for the price. I’ve bought a few low-cost knife sets only to find they are flimsy and nearly useless. This Chicago Cutlery set contains 16-pieces, at a low price. But they come with a full lifetime warranty, which should give you peace of mind when taking a chance on this set. The knives are made with high-carbon stainless steel, and the blades are made with a special 25-degree taper grind edge, which gives them a great deal of sharpness and precision. The stainless steel handle gives the knives a very contemporary, modern look. They have a full metal tang, so they are easy to wash and re-sharpen. The handle has a curved design to make them easier to hold onto. This 16-piece set includes an 8” chef knife, a 6-3/4” bread knives, two 4-3/4” utility knives and two 3-1/4” parers, eight 4-1/2” steak knives, shears, a sharpening steel, and a neutral wood block. 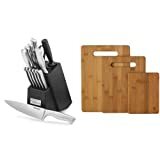 Cuisinart 15-Piece Stainless Steel Hollow Handle Block Set, C77SS-15PK & Totally Bamboo Original 3 Piece Bamboo Cutting & Serving Board Set. 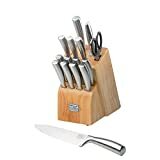 As far as budget knife block sets go, this Cuisinart 15-piece set is reliable and user friendly, not to mention a very good value. The high-carbon stainless steel blades are build for stability and control. The ergonomically designed handle was made for comfort and a good grip, so you can work with ease. I particularly like their sleek, modern design, which will fit in to any kitchen. They have precision tapered blades to provide excellent sharpness that holds so you won’t have to resharpen them often. And they come with a lifetime guarantee. For the price, there’s really not much more you can ask for in a knife set. 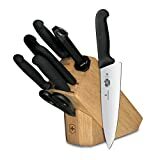 This set includes an 8″ chef knife, 8″ slicing knife, 7″ Santoku knife, 5.5″ serrated utility knife, 3.5″ paring knife, 3.5″ bird’s beak paring knife, 8″ sharpening steel, household shears and the block to hold them all. What do you think? Have you learned a lot about the different kitchen knives? And now you know how to put together your own set? I hope you find the right knives for you. It does make working in the kitchen so much easier and enjoyable. And don’t forget, you have to keep those knives sharp once you’re using them regularly. Check out our guide to finding the best knife sharpeners. Want to save this post for later? Pin it on your Pinterest board! Looking for a knife block set? Check out our these top recommendations by On the Sharp Side.